II BY IV DESIGN was honoured as winner of the Interior Design Award – Future category, sponsored by Axolight, and garnered profound recognition as Overall Winner of the Year for The Residences of 488 University Avenue. 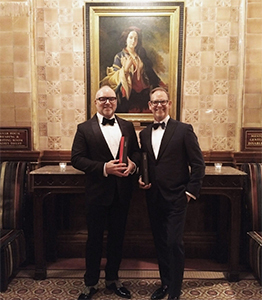 With projects spanning the globe from over 25 countries, the overall winner was selected from among 78 incredible shortlisted entries across 17 categories. Auberge On The Park is a new Tridel development with a distinctly French flavour and boutique hotel feel. Located along Eglinton Avenue East, two of the three planned towers housing 402 suites are currently in the works with completion expected in 2021. 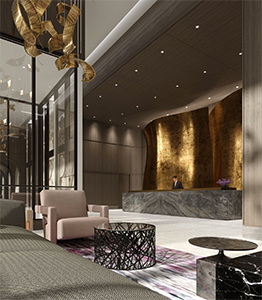 This, the first phase, recalls the notion of grand salons with 8,000 square feet of shared indoor amenities that will have an inspiring, amusing and distinctly social atmosphere. Known for designing luxurious interiors and unique products, II BY IV DESIGN prides itself on bringing the most innovative design solutions to life. And to create inspirational design worthy of applause, the studio continuously seeks out new inspiration. 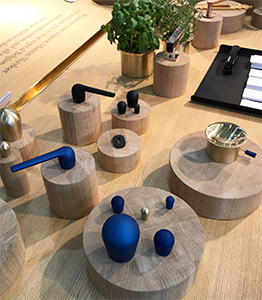 II BY IV DESIGN recently attended Maison & Objet in Paris, a five day extravaganza that attracts 85,000 visitors and 3,200 international brands, connecting the international design and lifestyle community. A true sensorial experience, with three design themes spread throughout nine halls, the team explored the eclectic show for the new, bespoke and creative.